EDMONTON — A unit of a giant Chinese petrochemical corporation can face trial on safety charges in the deaths of two oilsands workers more than five years ago. The Alberta Court of Appeal has upheld a ruling that Sinopec Shanghai Engineering Co. can be prosecuted under the Health and Safety Act. The court also ruled Wednesday that the Crown can apply to hold a trial on the charges under the Criminal Code if Sinopec Shanghai does not show up in court. 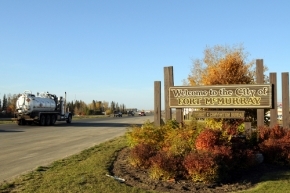 The two temporary workers from China were killed on April 24, 2007, when a storage tank collapsed at Canadian Natural Resources Ltd.'s Horizon project near Fort McMurray. Sinopec Shanghai, which brought the workers to Alberta, argued it has no official presence in Canada and was never properly served with legal documents. One of the three Appeal Court justices wrote a dissenting opinion, so the company may seek leave to appeal the ruling to the Supreme Court of Canada. Canadian Natural Resources and SSEC Canada, which is 90 per cent owned by Sinopec, are to go to trial on 53 charges next October — more than five years after the workers died. Josh Stewart, an Alberta Justice Department official, said the Appeal Court ruling means the Crown will apply to prosecute the three companies together. "The Crown will be returning to provincial court and we will be asking for Sinopec Shanghai Engineering to be tried jointly with CNRL and SSEC Canada Ltd. on the information that is presently scheduled for trial in October 2012," he said. Balfour Der, Sinopec Shanghai's lawyer, said he was reviewing the judgment and discussing it with his client. Officials with Canadian Natural Resources, which wanted Sinopec included in the case, declined to comment on the ruling. Court documents show Sinopec repeatedly missed court appearances on the charges in 2009. An official with SSEC Canada was eventually served a summons to appear. Sinopec hired a lawyer and began arguing it should not be included in the case. A provincial court judge ruled last year in Sinopec's favour, but the Crown successfully challenged that ruling in Court of Queen's Bench. The Alberta Federation of Labour and the Christian Labour Relations Association have been critical of the long delay in prosecuting the case. Federation president Gil McGowan applauded Wednesday's decision. "If these international companies want to do business here they have to not only respect our laws, but also be accountable when they break them," McGowan said. "We are very pleased that the court is not allowing Sinopec to wriggle off the hook." McGowan said Alberta is preparing for another influx of temporary foreign workers, including some from China. He said the government would learn lessons from the case that could prevent similar deaths in the future. Companies owned by the Chinese government are major players in Canada's energy industry with $11 billion in investments in the last two years. Units of Sinopec have spent more than $7 billion in Alberta since 2009. The deals include the recent purchase of Daylight Energy Ltd., and major stakes in oilsands projects such as Syncrude and Total E&P Canada's Northern Lights. Last summer, state-owned China National Offshore Oil Corp. announced a $2.1-billion deal to buy OPTI Canada Inc., an Alberta oilsands company. In 2009, PetroChina announced it was spending $1.9 billion to buy into the Athabasca Oil Sands Corp.